Retired solicitor Alasdair Mills is an avid collector of all things related to Sir Walter Scott, so when his latest and most prized possession, the slippers worn by Scott are stolen, he is outraged. Further outrage is experienced when PC Buchan calls it a common burglary, seemingly unmoved by Alasdair’s loss. With his wife Sophie engrossed in the organisation of the inaugural ‘High Tea in the Park’ event in Stirling, Alasdair turns to his friend Abigail Craig, Stirling’s head librarian, for commiseration. With no action from the police, when a piece of information comes his way and armed with The Detectives Handbook, Alasdair convinces Abigail that they should turn detectives and track down the thief or thieves themselves. This decision taken relatively light heartedly as they don disguises, and set off to investigate, leads them into considerable trouble, as they discover through interesting means a more sinister situation than just a theft of a pair of slippers. Rich in fascinating characters, this is a fun read. 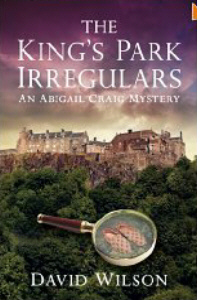 The first in a new series featuring librarian Abigail Craig, I heartily recommend this book for those of you who like me, enjoy a caper novel. David Wilson works as a Shipping Manager in Stirling. This is his first work of fiction. He lives in Stirling, Scotland with his wife Lynne Wilson, author of Murder & Crime Stirling and A Grim Almanac of Glasgow.